Icebug Oribi 3 RB9X has just been released by Icebug. Our experts are working on a detailed review. Please, come back later. Being new to the brand, I felt intrigued to try out a shoe whose primary purpose was to provide additional grip and support over varied terrain with road, trail, and track in mind. Overall, the IceBug Oribi 3 RB9X doesn’t disappoint and clearly has been improved over the past few iterations, but could definitely still use a few tweaks to make it the best it can be. 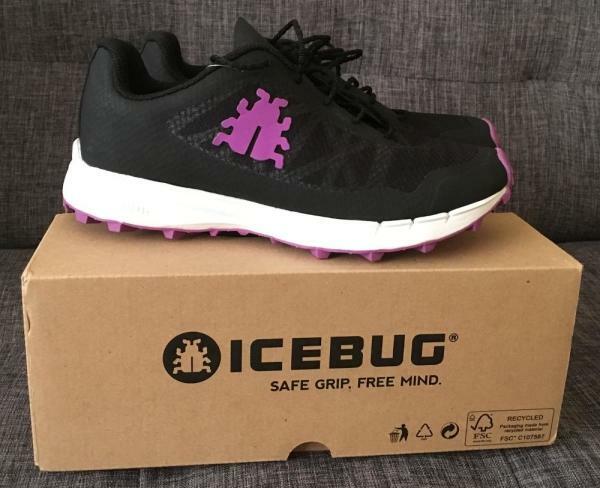 While I do tend to like my shoes to run wide in the toe box, Icebug does list this model as a specifically narrow lasted shoe, and does provide fair toe box height and width while cradling the foot a bit on the firm and snug side. If you are new to the brand and tend to prefer the fit of an Altra, Topo, or Keen, this may not be the shoe for you. I did order my normal size (US 10.5 or 44 EU) and even with thicker wool socks that I use out on the trails, it felt like a solid fit. It took about 10-15 miles of breaking in and a good bit of moisture buildup in the shoe to allow the toe box to better mold to the foot. It still felt like it hugged the foot well, but provided a bit more flexibility to allow movement of toes for proper mechanics. The material is very rugged but supple with overlays of TPU lining the sides and midfoot of the shoe as well as a lip of it over the top of the toe guard. It does a great job during normal conditions with breathability for a trail runner. The mesh vents on the top contribute considerably to its ability to keep the foot cool during longer workouts and high temps. I have taken this shoe on technical trail areas, grassy trails, as well as through mud and through wooded areas and it keeps the foot blister-free. The only weakness seemed to be that in the early mornings with grassy, dew-soaked areas and working through creeks and water, the side TPU doesn’t quite reach high enough to keep the foot dry. In addition, while the midfoot elastic system does a great job locking in the foot and the mesh possesses good moisture wicking properties. The light weight features though may leave the medial arch mildly susceptible to hotspots. Having said that, for a nominal upgrade in price, the company does offer a “GTX” version with the patented Gore-Tex hydrophobic liner to remedy this for individuals seeking a more dry ride through wet conditions with a smooth feel to the foot. The heel has a very spartan but relatively comfortable lining and does have a heel counter. It is forgiving and mild in its structure which cradles the heel and Achilles but doesn’t feel irritating or overly restrictive to natural rearfoot motion through the gait cycle. In addition, the sausage-link lacing system is a very nice touch and I have never had the laces come undone. They are also thin and light enough to avoid attracting burrs and debris. 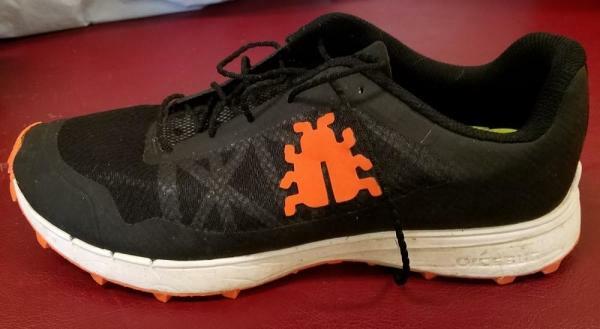 In fact, with the slick material of the overlays I found that even when using the shoe as a hiker or getting into the tall brush on my trips playing disc golf, the shoes rarely picked up a lot of unwanted seed, stickers and the like. On the rare occasion they did, it was easy to brush off with a towel or rinse off in water. In terms of midsole cushioning, this shoe really shines. The EVA foam is very light and feels plush for the stack height underfoot. At a total weight of 8.29 oz. (235g) for a men's size 9, it is firmly toward the lighter end of the spectrum for a trail shoe. However, for a shoe that is designed for usage on the trails, it may be a little overly well apportioned in the heel. With a 7mm heel to toe drop it is slightly lower than the industry standard, but will be noticeable if you are used to close to zero drop or minimal trail footwear. For racing and faster workouts, however, the mild drop can be helpful with accelerating through the stride and my heel felt protected even when I took a misstep off the trail or overextended when running downhill. For those who tend to heel strike in general, this shoe should feel pleasing underfoot without feeling like running on a patch of marshmallows. The arch and rock plate give the shoe a firm ride in the forefoot, lending the toe off a moderately snappy feel. Nonetheless, one thing that could improve is the addition of some type of indentation or flex points in the mid to forefoot of the shoe to allow for greater range of motion in the toes and a slightly less stiff transition. The insole feels light and helps reduce friction. It has been holding up well in terms of molding to the foot and staying in place without glues or taping. However, the moisture management to the strobel and midsole leave a bit to be desired with longer runs in the heat. As I build up more of a sweat than the average runner, I felt a mild squishy sensation on later miles with distances over 10 miles. Relatively thin in nature, this insole has developed pleats at the edge of the heel and near the lateral midfoot area for some reason after approx. 2 weeks of wear. While not bothersome personally, this may again be an area for growth in later models to avoid the risk of friction and hotspots, especially for those who enjoy the sockless approach. The outsole on the Oribi 3 in terms of grip and overall feel is the strongest point of the shoe, as the company places the greatest emphasis on this part of the production. The rubber feels almost sticky on soft surfaces and road alike and helps keep the footing sure over wet ground and varied terrain. The tractor tire tread also seemed to help on hills, both on ascent and descent. If you are looking for a shoe to hug the trail while not feeling clunky and overly sticky on the road, this outsole delivers in this regard. Impressively, unlike other aggressively-treaded trail runners, this pattern did not cause any undue irritation to the ball of the foot over the ridges. In terms of tread life, the outsole seems to be holding up better than average for the soft feel it provides. After about 30 miles, one can start to notice the depth of the tread decrease slightly, especially at the toe of the shoe (a common trade-off with softer rubber compounds), but this does not seem to affect the overall traction to this point in the life of the shoe (now to about 100 miles in), but may affect performance over uneven or unstable surfaces in the latter stages of life in the shoe past the 200-300 mile marks. One small consideration (although purely cosmetic) is the attachment of an exterior logo to the lateral midfoot of the shoe. Unlike other models in the Icebug line, there is a rubber logo affixed to the mesh and TPU overlay versus a 3-D printing, screen or sublimation. While it seems to be holding up relatively well, the edges appear to be coming up near the hind legs and feelers of the logo. While this model is still in the early iterations, it clearly is advancing in the overall look of the shoe. While previous models had a more boxy and plain look, the Oribi 3 has a cross-hatched patterning through the midfoot and sleek curves through the midsole giving it as streamlined a look as the shoe feels on the road, track and trail. The main colorway fits well together and is pleasing to the eye. However, the ever-present spectre of the white midsole tends to fade and look cream to taupe colored when used for its primary function as a trail shoe. It might be better served with a darker color to maintain the out of the box look for longer (although this certainly shouldn’t be a primary concern for most trail and outdoor enthusiasts, some day hikers, weekend warriors, and folks using this shoe as a winter road shoe). One other area for potential growth as the Oribi 3 RB9X progresses is the addition of alternate colorways, as this current model boasts only one alternate color scheme. As the company expands its influence and grows in popularity, it would be great to see some additional options to meet a broader range of consumer tastes. While the Oribi 3 RB9X is still in the early models of development and has room to grow, Icebug has struck a nice balance of grip and ride with a rugged trail runner while staying light enough for road and track work. For the purpose of review, I’d like to thank Icebug for providing me with a pair of Oribi 3 RB9X shoes. No additional compensation was provided and the review process objective over the course of a normal life cycle of my daily training shoes. With the recent Icebug shoe test initiative for the Spring-Summer 2018 edition, I got a chance to try out the new Oribi3 W RB9X. Shoes that are made for tough weather conditions and diverse terrain. Well, what else can you expect from shoes that came from Sweden? After a bit more than 100km of trail running, a race and some additional km on off-road walks, I have some idea about what these shoes are made of. At first sight, I truly liked the design of the shoes. They are pleasant to look at and the unique tractor style outsole with tiny bugs (a unique bug touch and brand signature) looks adorable. On another angle though, the shoes look a bit odd from the top. The feet look a bit flat and too fluffy sideways and at specific positions, the air pockets appear on the outer sides. I find the form unusual but it feels alright. This is a completely personal preference, but for summer shoes I would be more happy with a brighter color for the upper. The lace has the same color as the outsole. Other than these, the overall look is very likable. The Icebug Oribi3 W RB9X is true to size but I would not recommend it for people with narrow feet. Mine is more or less average width, but the toe box seems wider than standard. During simple training, I do not feel this, but on sharp and fast turns it comes out as reduced stability and my feet do not feel completely fixed and get tiny shifts sideways. I always pay attention to the first runs. Before shoes are worn in, it is important to have comfort right from the beginning to avoid sores and blisters. That's the first indicator of a well-built shoe. After first short runs, Oribi3 W RB9X proved to be good shoes, so no hurt feet, toes, and heels all good. Decided to do a trail running race (20km+) with these shoes as training went well. Unfortunately, my feet got hurt. The seam of the tongue grazed some blisters on the top of my feet and I got blue toe from shifting sideways on turns. These shoes are light and give you all to be fast on the track. They are nice and fast but pay attention to the terrain and weather conditions. I discovered that performance is better on muddy and wet terrain, but not completely perfect on dry surfaces, steep uphill and downhill, and fast and sharp turns. Surprisingly, I did enjoy running on the sandy beach which is a rare occasion as mostly, I'm not comfortable when running on wet beach sand. Here is a short summary based on my runs so far. Visually, the upper is decent – seamless upper is made of polyester mesh with welded TPU mudguard. The mesh provides very good ventilation, also it is non-absorbing, which allows squeezing water out of shoes quickly while running. Tried it– it works. The downside of this is that material is very firm, even a bit rough and has 0 elastic abilities, meanwhile, padding of upper is existent basically only at the heel support. If the width of the shoes does not fit completely perfect, the feet will not be fully embraced, fixed and supported, and even the tiny discrepancy will be felt on the track. I would like a bit more padding or some elasticity to the mesh, even if it increases weight or absorbance ability. I like the job that is done on the heel counter and collar. It is firm and provides support, meanwhile has enough padding to be comfortable. So, no bruises or sore heels, just a nice ride. The tongue is very thin, sewn to the sole with an elastic band. Unfortunately, during my race, it turned out that there is a seam that may harm the feet. I did not face it during training runs, but during the race, after 15km, I started to feel sore on top of my feet – a place which I got hurt by shoes for the first time in my life. By hand, the seam feels quite ok, but while running it may graze and hurt the skin. I would recommend using overlock seam for this particular detail to cover up the edge. Sausage style lace – this is a good idea to make laces with laminated ribbons to keep it from untying. After training, during which I got in a really heavy rain, my shoes got soaking wet and the laces started to untie. In time, the ribbons started to flatten and it seems that this flattening decreases lace properties. Still, I like the idea and for sure this is not an issue that double bow cannot fix. As for soles, these are my first Icebugs, so it is hard to compare with previous models, for instance – the increased softness of midsole and the integrated Rock Shield. These soles provide good comfort and stability (though the toe box is too wide). It has good traction and grip. The positive side of that is if you have to cross or run some part of the distance on the road – concrete, asphalt, pavement etc. – the outsole still will be comfortable enough. Would I run in these? All in all, the Icebug Oribi3 W RB9X is good. Some details could be improved such as adding flexibility to the upper, a fixed seam and a bit more padding on the tongue, as well as some improvement on the laces. Other than that, these shoes could be a very good choice for summer equipment – if you get a good deal, give it a try! The midsole of the Icebug Oribi 3 RB9X is softer when compared to the previous version. The change is from 58A to 54A. With the right combination of the 7 mm drop, it aims to deliver the right amount of support that the neutral runner needs throughout the activities. The updated tongue is utilized in the footwear. A more direct feeling is encouraged because of its thin construction. A lowered height of the heel reinforcement is used in this model. Its soft heel cup has a firm heel grip and padded collar. The primary focus of the heel cup is to give the foot additional support when running. The Icebug Oribi 3 RB9X is crafted as a trail running shoe. Its features are strategically-engineered for those who need exceptional support in their sessions. For its length, the footwear follows the standard measurements. Medium-footed runners are sure to be accommodated by this shoe without having to worry about experiencing any discomfort. It provides a more comfortable and irritation-free during the run. B - Medium for the women's version and D - Medium for the men's version are the available widths. The tractor tire patterned outsole is integrated into the Icebug Oribi 3 RB9X. This component of the shoe provides enough grip throughout the running session. Everyday users and competition-runners can keep going on challenging trails because of the RB9X rubber compound. This material aims to deliver added durability. It has the ability to withstand all kinds of weather conditions and surfaces. The midsole area of the Icebug Oribi 3 RB9X utilizes the Rock Shield. With the use of this material, the foot is protected against rocky and uneven terrains. Torsional Stability is also an added feature of the shoe. It aims to deliver an excellent kick, especially in the last phases of the step. As a result, the foot is prevented from turning and twisting during the running activity. With the utilization of the torsional stability, possible injury to the foot is hindered. The seamless polyester bluesign mesh upper is integrated into the Icebug Oribi 3 RB9X. This material is described to be light in structure. This polyester bluesign mesh covers the upper section which aims to provide breathability to the platform. Users can tackle the trails with confidence in different weather conditions. To prevent any dirt and mud from coming inside the shoe, the welded TPU mudguard is utilized. By doing so, its lightweight structure is still maintained without affecting the overall breathability and comfort of the upper area. Laminated ribbons are integrated into the lacing system of the footwear. The laces do not untie quickly. As a result, midfoot security is offered throughout the run. The Icebug Oribi 3 RB9X uses a thin tongue unit. With its sock-like construction, it is meant to deliver a more comfortable and glove-like fit. The soft heel cup has a padded collar and firm heel grip. The focus of this material is to give the footwear more structure. Slightly lower height of the heel reinforcement is used in this version to provide more support to the foot.